Takaya Tours is excited to partner with Sea to Sky SUP, Yoga & Fitness to offer Stand Up Paddle (SUP) lessons, SUP Cultural Tours, SUP Yoga and SUP Fit classes in Belcarra Regional Park near Port Moody, (and by request in North Vancouver from Cate’s Park or Strathcona Park) in the traditional ancestral territory of the Tsleil-Waututh First Nation. All of our classes are taught by Nikki Johnston Beaudoin, a Certified Paddle Canada Stand Up Paddle Instructor, yoga teacher and personal trainer. Looking for a group activity? 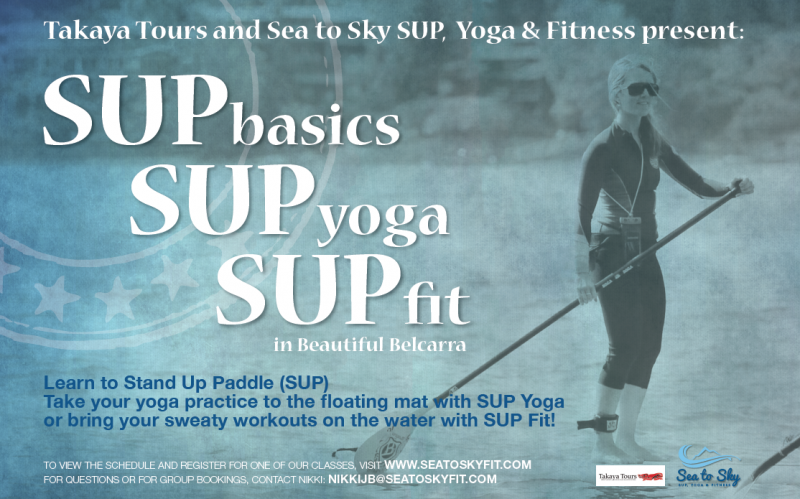 Book a SUP lesson, SUP Cultural Tour, or a SUP Yoga or SUP Fitness class. Great for bachlorette parties, birthday parties, family reunions, team building activities or any other group get together. A one and a half hour introductory lesson to Stand Up Paddling, where you learn the basics of SUP form and strokes, venture with your paddle board in the calm and majestic waters of Indian Arm. Price: $65, includes all gear and PFD. A one and half hour tour of magestic Indian Arm includes an introduction to Stand Up Paddling, in addition to a guided tour with local Takaya Tour guides from the Tseil-Wauth First Nation, who will share traditional and cultural knowledge of the waterway and territory. Take your practice to the most awe-inspiring studio around. Experience a serene, blissful practice that combines balance, strength and pranayama and culminates with a relaxing savasna to the sounds of water lapping against your board. Prepare to leave refreshed, rejuvenated and grateful. Price: $25 with your own gear, or $35 to rent all gear. Or pre-purchase 4 sessions for $140 including all rental gear. Take your workout to the water! Join us for a warm-up on the beach, get your sweat on with a cardio-paddle along Indian Arm while toning your upper body and core through a series of HIIT exercises on the board. You may never want to workout on land again! This two hour workshop will teach you the basics of Stand Up Paddling, and will end in a blissful asana practice or a sweaty workout on the water – you choose! Price: $70 with your own gear, or $80 to rent all gear.